Thanks to Life as You Live It for developing the 52 week Money Saving Challenge. According to the creator, every year he does this to save up on something really nice at the end of the year. This could be buying a new gadget or having a vacation somewhere. You can also build up your emergency fund or retirement fund from here. 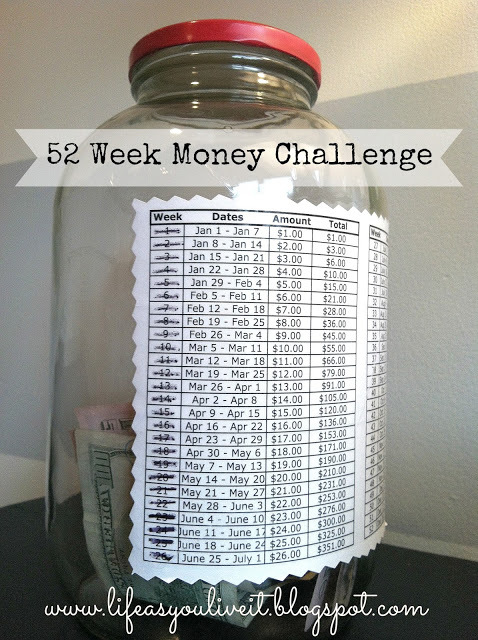 The 52 week money saving challenge is certainly a great way to save this year. After all, you are compounding the money in different intervals making it simple and cost effective. To get you started with this challenge here are a few items that you need. • A goal. This will keep you motivated to save and save. Simply imagine getting your most coveted gadget by the end of the year. Or perhaps buying gifts for your family and friends. Simply pick an item that you normally don’t splurge. 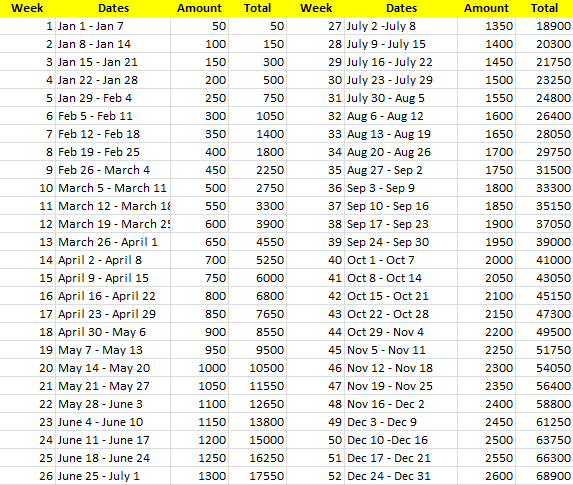 From there, break it down in terms of your weekly amount to save. Thinking of the item I would want to buy made me giggle and happy. I simply can’t wait to get started. • A piggy bank. The original poster has a clear bottle where he puts the money. I prefer a covered one though so I won’t see the money stack in there and count how much I already saved. You can use a plastic container, a bottle, a jar or just about anything. This will be called a grownup piggy bank. • Template. The challenge has an existing template that we can print out and tape in our piggy bank. However, since the amount is in dollars, I took the liberty to edit the dollar part and translate it into Philippine Peso. Plus, I altered the dollar equivalent to Php50. Here’s the sheet that you can follow and download. Imagine being able to save as much as 68,900 for the year. That is more than enough for a brand new phone or a brand new laptop. Perhaps you can buy both, a phone and a laptop. I’m thinking of buying a designer bag this time. Whatever rocks your boat I am sure the amount would be a good help to you. Here are some more tips that can help you complete the 52 week money saving challenge. • For professionals who are paid twice a month, instead of doing a weekly challenge, you can do it twice a month. For instance, instead of putting in amounts for Jan 1 to Jan 7 and Jan 8 to Jan 14, you can sum up the two weeks and deposit 150 instead of 50 and 100. This will prove useful especially to bigger amounts in the latter part of the year. This also holds true for individuals who are paid once a month. • As you proceed with the saving up process, you can crash out weeks that you already fulfilled. This is like crashing out dates in your calendar. This will make you feel giddy inside. • If there are months that you are paid more than your usual salary, say for instance getting half of your 13th month pay, tax refund or more (good for you), you could do advance savings. You can deposit more in order to cover the other weeks. • Do not touch this. Since you know just how much you already saved, thanks for the sheet I posted, do not be tempted to get or even borrow from here. Secure your piggybank with tapes, plastics or whatnot. You may also open up another bank account for this purpose alone. Again, do not get money from here or else lightning will strike you for real. As MC Hammer would sing, “You Can’t Touch This”. I hope this would get you pump up to save for the year. This is also a better way to start 2014. So start saving! Let’s do the 52 week money saving challenge today. This entry was posted in Uncategorized and tagged MAPFRE, MAPFRE Insular, MI Mundo, Non-Life Insurance. Bookmark the permalink.